Water entrance stop and fissure arrest of a 280 mm long, 30 mm wide crack, located on bottom plating under Nº 1 WBT of a loaded cargo ship that collided with a rock during her navigation through a narrow river channel. A cement box was placed on top from inside WBT. Multicat Titon, boats and divers assisted MSM in deployment first section (300 m long) of sewage pipe at River Plate coast (Ciudad de la Costa, Uruguay). Contractor: Espina - MSM (Spain). Tugboat Nilo, 160 ton, sunk on 1946, 5 nm off Montevideo Port. Site had to be cleared for installation of GNL station. Fire was set inside Korean flag F/V Esperanza, on November 2009. Due to fire combat tasks, too much water was embarked, thus taking her to the bottom. She rested on the bottom with 35º list to port. After four weeks of hull preparation ( blanking openings, sealing water entrances, setting submersible pumps in position, etc), working in no visibility muddy waters, she was brough to surface and delivered in a safe condition to client , ANP ( Port Authority). Diving inside polluted water pools , using 100% water proof gear, at UPM pullp mill. Up to 17 tons Flipper Delta anchors, chains and bouys were laid to keep two Panamax bulkcarrier in position, at Punta del Arenal, Río Uruguay. Fenders were delivered to tankers during STS (ship to ship) operations. 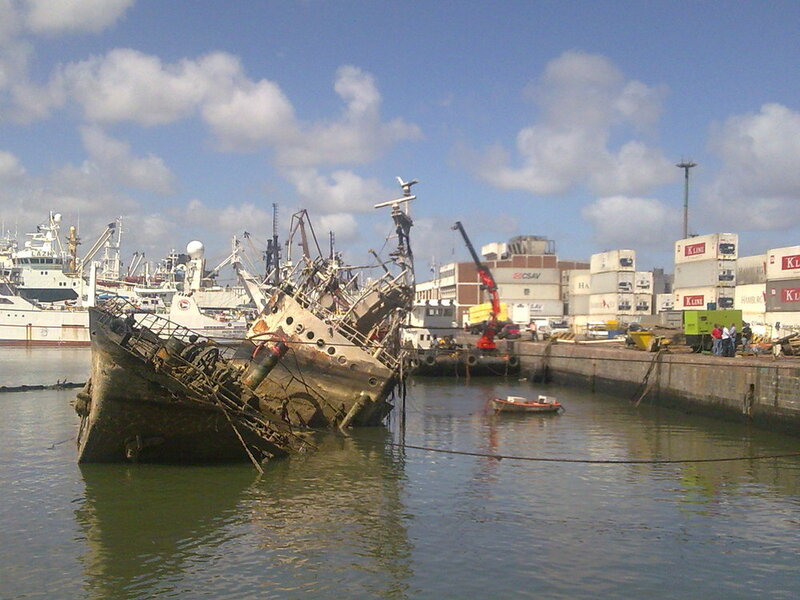 On May 2009, a 70m LOA spanish fishing vessel recalled Montevideo Port, in search of drydock to replace a broken propeller. 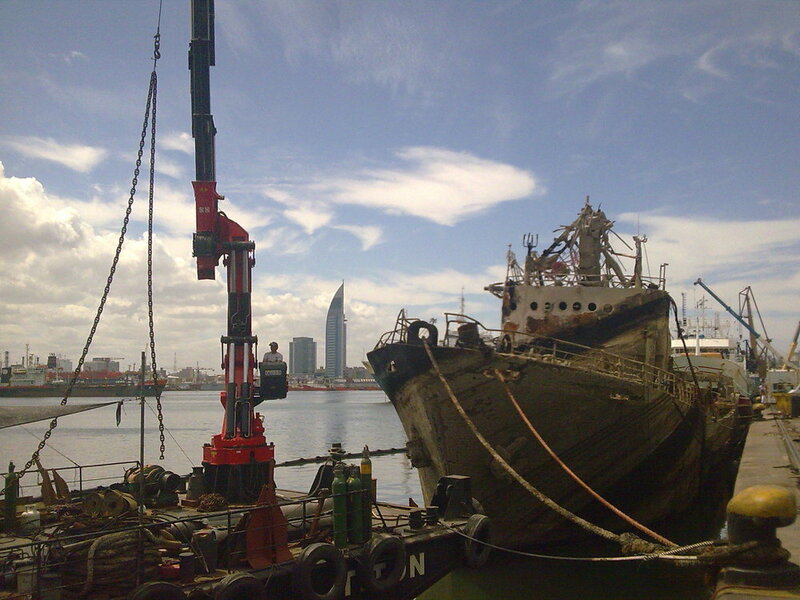 As all drydocks in the area were full, the owner trusted our company to accomplish the job. A five divers team, working with reduced water visibility, replaced the broken propeller (one blade missing) in some days. After trying with no success to release the propeller from the tail shaft , using a 120 tons hydraulic jack, it was finally decided to cut the propeller boss. Once this step was accomplished, the broken propeller was removed and the new one set in place. One hour after completion, the vessel got underway to her assigned fishing zone (South Atlantic), at entire owners satisfaction.